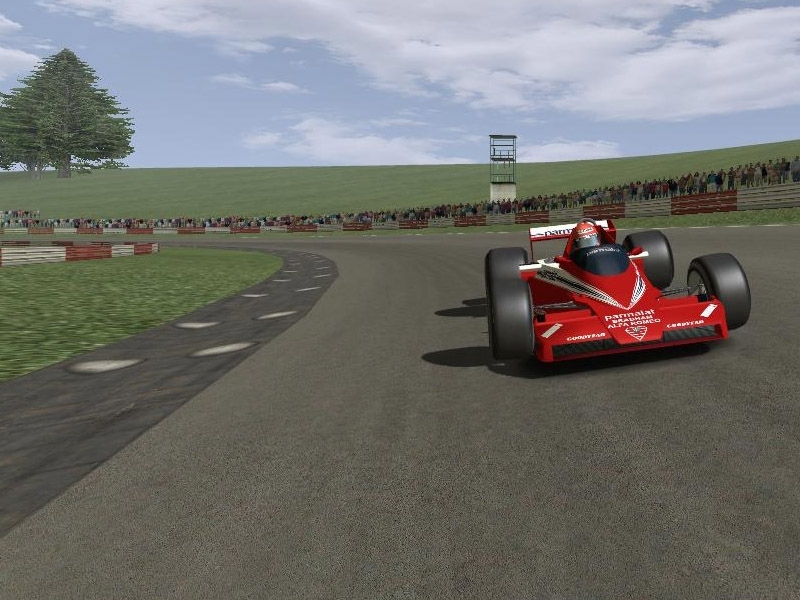 This is the an updated version of the 75 Oesterreich I recently released for GSC of the very fast Österreichring, before the chicane was built. to give a representation of the track as seen in the footage of the GP race of 1975. I had to remodel some parts, made and added the missing circuit control building.. placed some extra buildings .. altered the rise to Jochen Rindt Kurve.. reworked the trees and grass areas, hopefully to improve the appearance... new banners/sponsors of 75... when driving you may only see the back of them as the organisers still had them placed for TV footage. 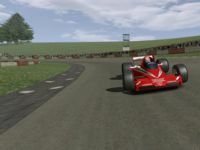 After adapting the aiw files I put the work into rFactor, GTR2 and GTL... GTR2 has the rain reflections, animated marshals GTL has the animated marshals and each has the appropiate startlights and pitlights.. rfactor version to be installed in a folder called "70stracks"
Originally built in 1969 to replace the bland and bumpy Zeltweg Airfield circuit, the Österreichring track was situated in the Styrian mountains and it was a spectacular, scenic and unique circuit. The track was very fast, every corner was a fast sweeper and was taken in no lower than 3rd gear in a 5-speed gearbox and 4th in a 6-speed gearbox and the track had noticeable changes in elevation during the course of a lap. Like most fast circuits it was a hard circuit on engines but more difficult on tires, because of the speeds being so consistently high. Many considered the Österreichring to be dangerous, especially the Bosch Kurve, a 180-degree downhill right-hand corner with almost no run-off area which, by 1986 when turbos pushed Formula One engine power to upwards of 1,400 bhp (1,044 kW; 1,419 PS) in qualifying, had cars approaching at well over 320km/h (200mph). There were other testing corners such as Voest-Hugel, which was a flat-out 180 mph right hander that eventually led to the 150 mph Sebring-Auspuff Kurve (this corner had many names over the years, Dr. Tiroch and Glatz Kurve were others) which was an essential corner to get right because of the long straight afterwards that led to the Bosch Kurve. Added a few more updates mainly armco poles to some barrier sections, changed the appearance of the grass textures, made and added the missing Puch Tower. There are currently no setups for 75 Oesterreich. Add a Setup. wonder woman costumeThe 2004 Williams FW26 is the third vehicle installment for the F1 Classics Mod and provides both driver skins of Ralf Schumacher and Juan Pablo Montoya however helmet and driver body/suit models and skins are not included in the initial release but will be in a future update once our own animated driver body is finalized. The YouTube video on top of this page is still private. How difficult is it to change this? The YouTube video is private, I can't watch it. Because , if I remember correctly, I think I went to You Tube to view the mod, and it said something about a private video. What exactly are you referring to? What secrets? Thanks for expanding on your thoughts. Why in the world would you take your talent and disallow other Rf users not be able to view and enjoy your talent. (you tube) Must be logistics I giesss. I am not much into sim racing as I am consoles, so what am I missing of the secrecrys/private, if you made a mod for for the whole world to enjoy? I am so confused. as usual.